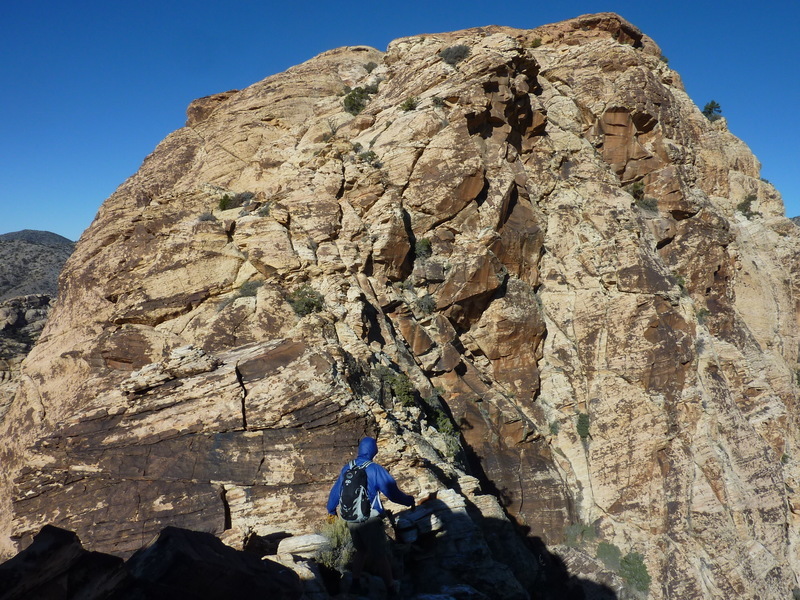 On our last day in Red Rocks NRA, NV, we had a pair of sandstone summits on the agenda, the last two I had left of 59 that get mention in Courtney Purcell's Rambles & Scrambles. Located in the southern part of the range, they are most easily approached from SR160, near where we had spent the night at the Late Night TH. The clouds were gone today, but not the wind and the chill that had hung around for the last week almost continuously. Our starting point would be a turnout in the dirt road that runs close to the base of the peaks heading north, about a mile from SR160. We had gotten up fairly early, allowing us a start around 7:15a to facilitate Tom getting home to Southern California at a reasonable hour. Heading cross-country from the start, we soon picked up a use trail that headed northwest and west towards the broad canyon south of Windy Peak (Purcell calls this Windy Canyon). We had intended to follow the route described in the guidebook, a wordy and complicated-sounding narrative that Tom did his best to half-memorize before starting out. My attention fuzzed out after the first half paragraph though the description goes on for two full pages. "Don't we just follow the ducks?" I asked, hoping to simplify things considerably. And so we did. Only the ducks I picked out didn't lead us to the south side of Windy and the mystical ramp described by Courtney. Instead, they lead us to the base of the poorly-defined (at least at first) SE Ridge which seemed might work just as nicely. Better in fact, since we took the advertised route on the descent and found it rather so-so in comparison to the SE Ridge which we decided was a much better choice. The SE Ridge route starts up a steep gully on the same side, eventually converting to as the brush and scree gave way to more solid rock and little brush. Part way up I spotted a bighorn ewe with a lamb that I quietly pointed out to Tom, but we were spotted well before we could get our cameras out and they were quickly out of sight. "That's the last we'll see of them," I offered, expecting them to be over the ridge and out of sight before we could take three more steps. A few minutes later, as we climbed higher, Tom spotted the ewe again above us about 75yds off, staring down at us from the ridge. We soon learned the cause when we spotted the lamb, not even a month old, on a ledge below, unable to make it higher to where Mom was pacing nervously. We took a few pictures and continued up, traversing left away from the two sheep, knowing our presence was making both more nervous by the minute. Five minutes later we were well above when I looked back and spotted baby staring up at us, motionless from the same ledge it had gotten stopped at. Mom was nowhere to be seen but we didn't wait around for her to present herself, putting distance between us and baby as fast as we could. The last 20min of the ridge were the most interesting with moderately exposed class 3 scrambling on excellent rock, with a jagged ridgeline in places to keep things interesting. There was also some fresh snow on the shady northern aspects from a brief storm that had passed through during the night. It was more a dusting here, but would present more of an obstacle on our way to the second peak. It was after 9a by the time we found our way to Windy's summit. The wind kept us from enjoying the open views for more than a brief minute, finding no refuge out of the wind that seemed to hit us from more than one angle. We signed another busy register before packing it away and heading off to Global Peak. For Global, we got no help from our guidebook which describes only a route from the backside, approaching from the limestone crest of the Spring Mtns behind the sandstone formations. We didn't expect it to be too hard to reach from Windy's summit, knowing it's a short distance off the ridgeline connecting Windy to the limestone crest. It was mostly a class 2 scramble as we continued over the summit in a northwesterly direction, making our way towards Global less than half a mile away. When we reached the saddle where sandstone meets limestone, we picked up a trail, the one used to approach Windy from the backside, also described in Courtney's book. We then discovered another trail forking right off this one with several ducks that we guessed would lead to Global which it did, sort of. This decent use trail traverses the backside of the ridgeline to reach a point above the saddle with Global, but with a fearsome drop of perhaps 100ft to the saddle itself. This proved terribly perplexing and problematic as we could find no reasonable way down, try as we might. We found a rappel chain held by a pair of bolt anchors but this would do us no good without a rope. We needed another option. The other options, it seems, are to either backtrack or continue along the use trail for a few hundred yards until the steep limestone terrain could be negotiated. We did the backtracking option, carefully negotiating the snow and scree on the steep slopes that would drop us the hundred feet necessary until we could traverse across more steep slopes to the saddle. A little bit of route-finding is necessary to keep things to class 3 or less, with a key slot used to finally gain the saddle. From there it's less than five minutes to the summit over easier terrain. Windy and Global are both part of the 52 Peak Club's list, the seven of hearts and nine of clubs, respectively. A pair of "Jokers" were found in the Global register. Both peaks' registers are filled with entries from this club and the Hiking Las Vegas Club, the brainchildren of Branch Whitney who has made a career out of writing guidebooks for the Las Vegas area and getting people to pay club dues for the priviledge of hiking these peaks with him. I don't say that to be derogatory, by the way - I'm impressed that he's figured out how to make this hobby pay while I'm too lazy and without the drive necessary to do similarly.